Looking for Heat Pump or Solar Pool Heating Sunshine Coast? Sun City Hot Water & Plumbing are your local hot water specialists and we now do Pool Heating! After testing solar and heat pump pool heaters in our own homes, we have decided to start providing them for our clients. We have Heat pump pool heaters that not only heat the water but will also cool it if required in summer, for those days when you just wanna cool down and the sun-heated pool water just isn’t cutting it. With a heat pump pool heating system, you can set the temperature to be the same every day of the year! Imagine being able to get the kids out of the house and have a warm comfortable swim in winter. 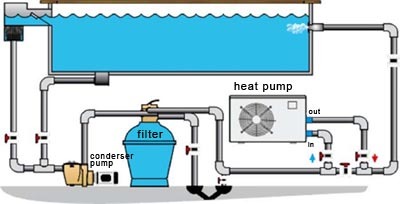 Heat pump pool heating systems use electricity to capture heat from the air and transfer it to the pool water. A heat pump system is made up of four main components; the fan, the evaporator coil, the compressor, and the condenser. The fan draws warm outside air into the system. The outside air is then directed to the evaporator coil. Inside the evaporator coil, there is a liquid refrigerant that absorbs the heat from the air. As the temperature of the refrigerant increases, it transforms from a cool liquid to a warm gas. Once the refrigerant becomes a gas, it is circulated through the compressor. Here the gas is compressed which raises its temperature. The now hot gas is directed through to the condenser where the heat is transferred from the hot gas to the cool pool water that is constantly circulating through the condenser. As the gas loses its heat it reverts back to liquid form and is redirected back through to the evaporator coil to repeat the process. Though heat pump pool heaters use the heat from the air to heat the pool water, they still work efficiently in cooler conditions. In fact, a heat pump pool heating system works efficiently with an air temperature of just over 7 degrees Celsius. Perfect for year-round use in the Queensland climate. Solar pool heating is the most cost-effective use of solar power in many climates*.Solar pool heating systems use solar power and the heat from the sun to heat the pool water. A solar pool heating system is made up of four main parts; a control valve, a pump, a filter and the solar collectors. The solar collectors are made to collect and retain heat from the sun. Once the temperature of the solar collector is higher than the pool water temperature, the control valve diverts the pool water into the filter. Once all debris has been removed from the water by the filter, the water is circulated through the solar collector where the heat is transferred to the water. The now heated water is then circulated back into the pool. This process is repeated until the pool water temperature is higher than that of the solar collectors. Some control valves may be manually operated. In this case, instead of the system automatically starting when the temperature of the pool drops below that of the solar collectors, you can choose when to heat the pool water. For more information and pricing call Sun City on 1300 728 122.